Aiseesoft iPad 2 to Computer Transfer can conveniently help you transfer music, movies, camera roll, and picture from iPad 2 to computer without losing anything. Also it allows you to transfer iPad 2 files to iTunes on computer for backup. Moreover, this iPad 2 to Computer Transfer can support all the iPod, iPhone and iPad versions, including the latest iPhone 4S and iOS 5. 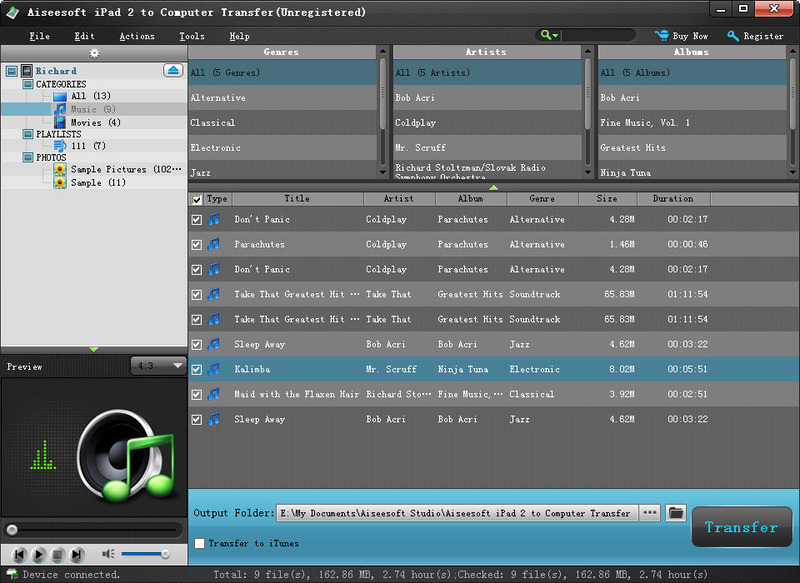 Transfer music, movies, camera roll, and picture from iPad 2 to PC without loss. ...... movies, camera roll, and picture from iPad 2 to your local disc. You are able to transfer your iPad 2 files to iTunes on computer for backup. Qweas is providing links to Aiseesoft iPad 2 to Computer Transfer 6.1.28 as a courtesy, and makes no representations regarding Aiseesoft iPad 2 to Computer Transfer or any other applications or any information related thereto. Any questions, complaints or claims regarding this application Aiseesoft iPad 2 to Computer Transfer 6.1.28 must be directed to the appropriate software vendor. You may click the publisher link of Aiseesoft iPad 2 to Computer Transfer on the top of this page to get more details about the vendor.